Lightening denim or getting her beautiful patterns-divorces again becoming popular. Some immediately run into another fashion store for the right color and painting, jeans. Others buy trendy jeans on the market – the Turks and the Chinese are always happy to work for your money. Why would you do that? It is not necessary to overpay for these models – after all the house you can make jeans of this color as you like! So 25-30 years ago many fashionistas were wearing designer clothes made from denim. Read on – you yourself want to try to do it, but it is so simple. How to wash jeans products? • 30-40 minutes of free time. As soon as this is found then you can proceed to cooking of jeans. To obtain a divorce twist jeans. The stronger the twist, the less we get a divorce. Form of divorce depends on how you twist. If you just twist and secure with elastics, then divorce will be vertical. If you pin clamp – horizontal. When compression of jeans clothespins the image obtained in the form of asterisks. Fill metal container (bucket or pan) with water, a little more than half. Then put it on the stove. When the water in the vessel is heated to 80 degrees, pour one Cup of bleach. Then bring this solution to a boil while slowly stirring. 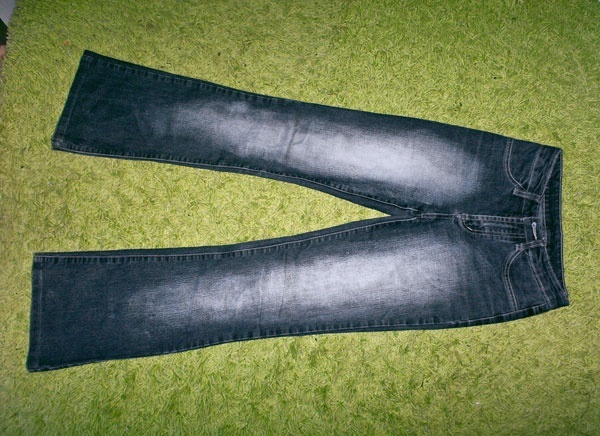 Once the water begins to boil – down of the previously prepared jeans. Be careful, use gloves. It is necessary to watch that all the time the jeans were in the water. If they are "naughty" - take a big stick or a spoon and submerge them back into the boiling water. If within a few minutes you will not notice the change of tone, you should add more bleach. Boiling jeans is about 15 minutes. To change the shade you'll know when they should get. When the result of cooking will be clearly visible, remove the jeans from the water and place them under cold running water. Do this very gently, the steam and water can burn your hands or face! Remove all the elastics, if they were, and thoroughly rinse the jeans under water. You can then hang them to dry. It is possible to conduct experiments with boiling jeans to weld only the top or the bottom, boil one side or to make a smooth color transition from top to bottom.